1) (Longnor, co. Salop, 1623). Per pale ar. and sa. on a saltire a crescent all counterchanged. Crest—A hind’s head couped ar. wounded on the breast with a pheon sa. dropping blood ppr. 2) (Boreatton, co. Salop). Per pale ar. and sa. a saltire counterchanged. Crest—A talbot sejant sa. collared or, lined az. the line tied to a halbert in pale of the second, headed of the last. 3) (Rowland Hunt, Esq., of Lincoln’s Inn). Per pale ar. and vert a saltire counterchanged, a canton erm. 4) (Richard Burges Hunt, Esq.). Or, on a bend sa. betw. two water bongets az. a chev. betw. three pheons of the field, a chief gu. thereon three leopards’ faces gold. Crest—A mount vert, thereon a talbot sejant or, gorged with a collar vair, attached by a ribband az. to a spear erect ppr. therefrom a banner flowing towards the sinister sa. charged with a pheon, as in the arms. 6) (Chalderston, co. Bedford). Ar. on a chev. within a bordure gu. an annulet or. 7) (Ashover, co. Derby, temp. Henry III., and Aston, same co., temp. Henry VIII.). Ar. a buglehorn sa. stringed vert, on a chief gu. three mullets pierced of the field. Crest—A buglehorn, as in the arms. 8) (Ashover, co. Derby, temp. Henry III., and Aston, same co., temp. Henry VIII.). Ar. a buglehorn sa. stringed vert, on a on a chief three roses or. Crest—A buglehorn, as in the arms. 9) (Chudleigh, co. Devon; traced in the Visit, of 1620 to the year 1500). (Exeter, co. Devon; Nicholas Hunt, of that place, Visit. 1620, great-grandson of Thomas Hunt, three times Mayor of Exeter). Az. on a bend betw. two water bougets or, three leopards’ faces gu. Crest—On a mount vert against a halbert erect in pale gu. headed ar. a talbot sejant or, collared and tied to the halbert of the second. 10) (Stockgrave, co. Devon, and of Worcester). Gu. on a fesse betw. three cinquefoils or, a lion pass. of the field. Crest—A boar’s head erect betw. two ostrich feathers sa. 11) (Romford, co. Essex). Per pale ar. and vert a saltire counterchanged, a canton erm. Crest—A talbot sejant sa. collared or, lined az. the line tied to a halbert in pale of the second, headed of the last. 12) (Hoggesback; co. Hereford). Sa. a fesse or, in chief two cinquefoils of the last. 13) (Lincoln’s Inn). Az. a bend betw. six leopards’ faccs or. Crest—A stag’s head erased ppr. 14) (Kilderveston, co. Norfolk). Per pale ar. and sa. a saltire counterchanged betw. four horseshoes gu. 15) (Hermyngtoft, co. Norfolk, and co. Suffolk). Vert a saltire or. Crest—A lion sejant erm. 16) (Lyndon and Hindon, co. Rutland, and Gayton, co. Stafford). Az. a bend between six leopards’ faces or. Crest—A leopard’s face betw. two wings expanded or. 17) (Stoke Lindon and Barradon, co. Rutland; granted by Cooke, Clarenceux, 20 July, 1585, to John Hunt, Esq., of Lindon and Stoke Aubeney, descended from John le Hunt, 40 Edward IlI., great-grandson of Gilbert de Stoke, called the Forester, and Matilda, his wife, dau. and heir of John Ridol, of Ramesthorpe and Ashley. Visit. Rutland, 1618). At. a bend betw. six leopards’ faces or, quartering Ridol. Crest—A leopard’s face between two wings expanded or. 18) (Longnor, co. Salop), Per pale ar. and sa. a saltire counterchanged. Crest—A lion’s head erased per pale ar. and sa. collared gu. lined and ringed or. 19) (Speckington, co. Somerset). Az. two chevronels betw. three martlets ar. 20) (Speckington, co. Somerset). Az. a chevron voided betw. three martlets ar. 21) Az. on a bend or, betw. six leopards’ faces of the second three water bougets sa. Crest—On a chapeau gu. turned up erm. a talbot statant ar. 22) Az. on a fesse ar. betw. three cinquefoils or, a lion pass. gu. Crest—A boar’s head couped and erect betw. two ostrich feathers. 23) Quarterly, or and sa. a cross lozengy counterchanged. 24) Per pale ar. and sa. a saltire counterchanged, on a canton of the second a lion pass. of the first. 25) Per pale ar. and sa. a saltire counterchanged, in chief a lion pass. guard. per pale of the second and first. 26) Az. a chev. (another, engr.) betw. three martlets ar. 27) Gu. a talbot pass. betw. three pheons or, a bordure engr. ar. pellettée. 28) Ar. a bordure gu. bezantée. 29) Ar. on a chev. within a bordure gu. five bezants. 31) Gu. an inescutcheon ar. within an orle of of crescents or. 32) Sa. on a fesse or, betw. three cinquefoils of the second a lion pass. gu. 33) (co. Norfolk). Gu. three mullets ar. on a bordure eight torteaux. 34) Gu. a hind springing ar. betw. three pheons or, a bordure of the last pellettée. 35) Gu. a hind trippant betw. three pheons or, within a bordure of the second (another, the bordure engr. ar.) pellettée. 36) (Lanhydrock, co. Cornwall). Per pale ar. and sa. a saltire counterchauged, quartering, ar. a talbot sa. sejant, collared and chained or, and fastened to a stake. 37) (Reg. Ulster’s Office to Captain Hunt, of Col. Chidley Cootes’ Regiment, the brotherof the first Earl of Mountrath). Sa. a chev.betw. six leopards’ faces or, on a chief of the last a lion pass. gu. holding in the dexter paw a snake ppr. Crest—Out of a ducal coronet or, an arm erect gu. the hand grasping the pommel and hilt of a broken sword gold. 38) (Fun. Ent. Ulster’s Office, 1677). Az. on a bend betw. three water bougets or, as many leopards’ faccs gu. 39) (Curragh, co. Limerick, bart., now De Vere; confirmed by Fortescue, Ulster, 1797, with an augmentation of the Castle of Limerick, as a memorial, Sir Vere Hunt, the first bart., having raised the 135th or Limerick Regiment of Infantry). Az. on a bend betw. two water bougets or, three leopards’ faces gu., and for augmentation, on a chief of the third a castle or port betw. two towers ar. masoned sa. with the Union Jack of England displ. from a flagstaff erect ppr., and in a canton of the field an Irish harp of the second, stringed of the fourth. Crest—A castle, as in the arms. This last name developed an English occupational name for a hunter, deriving from the Old English word hunta, meaning “to hunt”, a critical job during medieval times. The term was used to describe both large game hunting on horseback and smaller pursuits such as bird catching and poaching. It is believed the name was first used as a personal (first) name. 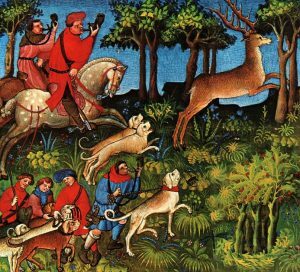 Another author asserts it derives from the Anglo-Saxon word hunta, meaning hunter, connected with hund, a hound or dog. Yet another author states it derives from the Old Norse word hundi and the German hundt. In some cases it is an Americanized spelling of the German surname Hundt, and an Anglicized version of Irish last names such as O’Fiaich and Fee. Some spelling variants or names with similar etymologies include Hunte, Huntt, and Haunt. Some assert that in England, the name was first established in Shropshire. The last name Hunt ranks 157th in popularity in the United Status as of the 2000 Census. The name ranks particularly high in the following six states: North Carolina, Utah, Kentucky, Vermont, Michigan, and Idaho. The surname Hunt frequency/commonness ranks as follows in the British Isles: England (89th), Scotland (386th), Wales (84th), Ireland (429th) and Northern Ireland (585th). In England, it ranks highest in counties Wiltshire, Dorset, and Berkshire. In Scotland, the surname ranks highest in Roxburghshire. In Wales, it ranks highest in Monmouthshire. In Ireland, it ranks highest in county Sligo. In Northern Ireland, it ranks highest in county Antrim. The name is also present throughout the remainder English speaking world: Canada (235th), New Zealand (78th), Australia (100th), and South Africa (969th). Henry Brougham Guppy’s 1890 book Homes of Family Names in Great Britain states the following in regard to this last name: “Well distributed through England, except in the north, where its place is supplied by Hunter, which has the same signification. It is best represented in the south of England, especially in the county of Dorset, and after that in those of Wilts and Somerset. It has also more than one stronghold in the midlands, as in the counties of Worcester, Derby, Notts, and Leicester”. One of the first bearers of this surname was Robert le Huant, who was recorded in Normandy, France in 1998 AD in the Magni Scaccarii Normanniae. Humphrey le Hunte was recorded in the charter rolls of Sussex, England in 1203 AD. Ralphe Hunte was documented in the Assize Rolls of Yorkshire in 1219 AD. The Hundred Rolls of 1273 AD, a census of Wales and England, known in Latin as Rotuli Hundredorum lists two bearers of this surname: Alice le Hunte (Oxfordshire) and Thomas le Hunte (Cambridge). Gilbert le Hunte was recorded in the Writs of Parliament in 1302 AD. Robert le Hunte (or Honte) was recorded in Kirby’s Quest in 1327 AD. The lineage or ancestry of this branch of the Hunt family tree traces back to William Hunt, who married Ellen Young, and had a son with her, also named William. This son, William Hunt was an Esquire of Pittencrieff. He married Janet, daughter of James Alexander of Balrudery, and had issue with her as follows: William (heir), James, and Christina (married James Harrowar of Inzievar). He was succeeded by his son William in 1807, but this son died five years later and he was succeeded by his brother James. James Hunt was an Esquire of Pittencrieff and Logie, Justice of the Peace, and Deputy Lieutenant who was born in 1785. In 1813, he married Margaret, daughter of John Grieve, and died in 1858, leaving the following children: William, John, James Alexander, Andrew (Lieutenant Colonel of the 79th Regiment), Robert, Ralph, Thomasina Agnes (married Sir Alexander Charles Gibson Maitland). He was succeeded by his son, James Alexander Hunt, who was born in 1818. James A. Hunt was an Esquire and Justice of the Peace. In 1818, he married Helen Maitland, and had five children with her as follows: James Maitland (born 1852), William Alexander, Alexander Charles, Jean Hamilton, and Helen Maitland. The family crest was a lion’s head erased and the family motto was Vi et virtute. They were seated at Pittencrieff and Logie and Dunfermline, county Fife, Scotland. This family is said to descend from Richard de Venator who lived during the reign of King Edward I of England (1272-1307). Thomas Hunt, of Stoke Dawnbenny, county Rutland, lived in 1430 AD, and was the son of Nicholas, and grandson of Thomas le Hunt. From hi descended Thomas Hunt, Esquire, born 1599, who was a Member of Parliament for Shrewsbury and was High Sheriff for Shropshire in 1656. After the restoration of King Charles II, he purchased the estate of Boreaton. He married Elizabeth Owen of Woodhouse, and had children with her as follows: Rowland (his heir), John (of Chester, married Anne Amphlett of Hadsor, had a son named Thomas, of Mollington, who married Mary Robartes), Thomas, Elizabeth, Martha (married Palmer of Wanlip), and Mary (1646). He died in 1669 and was succeeded by his eldest son. 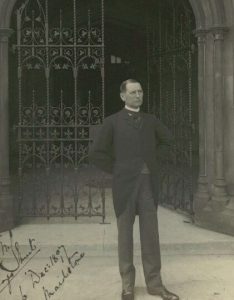 Rowland Hunt, Esq. of Boreatton, was born in 1629. He married Frances, daughter of William, 5th Lord Paget, and they had a son named Thomas. This son, Thomas Hunt, was born in 1669. He married Jane, daughter and heiress of Sir Edward Ward, Lord Chief Baron, and had issue with her. He passed away in 1752 and was succeeded by his son Thomas. This son, Thomas Hunt, was an Esquire of Boreatton who was born in 1704. He married Sarah, daughter of Edward Witts, and had issue with her. He in turn was succeeded by his son, Rowland. Rowland was born in 1753. He married Anne, daughter of Mark Cornish of London, and had issue with her: 1) Rowland (his heir), 2) George (Reverend, of Wadenhoe, county Northampton, married Emma, daughter of Samuel Gardiner of Coombe Lodge, had children named George Ward of Wadenhoe House), 3) Thomas (married Jane Harding, had issue named Thomas Henry, Charles John, William Cornish, Harriet Susanna Anne, and Caroline Emma), 4) Edward, 5) John, 6) Susannah Frances, and 7) Sarah Elizabeth. He died in 1811 and was succeeded by his son Rowland. 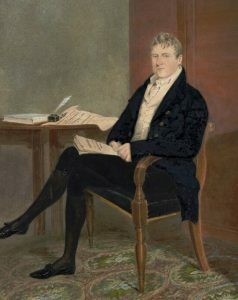 Rowland Hunt, Esquire of Boreatton, in 1823, married Mary, daughter of Thomas Lloyd of Shrewsbury and Glangwna, and had children with her as follows: Rowland, Thomas Edward Lloyd, Annabella Eliza, and Charlotte Frances. He died in 1836 and was succeeded by his son, also named Rowland. This Rownland Hunt, Esquire of Boreatton Park, county Salop and Kibworth Hall, county Leicester, was born in 1828. In 1857, he married Florence Marianne, daughter of R.B. Humfrey of Stoke Albany Hall, and had children with her as follows: Rowland, Edward Rowland, Thomas Rowland, Arthur Rowland, Richard, Mary, Florence Eliza, Amy, Agnes Gwendoline, Janet Laura, and Nina Marion. He died 1878. 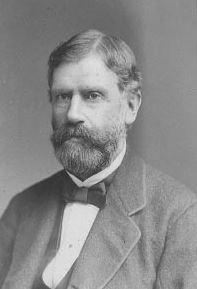 He was succeeded by his son Rowland in 1878. Rowland Hunt was an Esquire of Boreatton Park, county Salop, who was born in 1858. The Hunt Coat of Arms (or Hunt Family Crest) for this branch of the family is blazoned in the medieval art of heraldry as follows: Per pale argent and sable a saltire counterchanged. Crest: A Talbot sejant sable collared or, lined azure, the line tied to a halbert in pale of the second headed of the last. The Hunt genealogy traces back to a family that settled in Devon and are said to have descended from Henry Hunt, who lived during the reign of King Henry VII of England, who was a three time Mayor of Exeter. William Hunt, M.D., of Dartmouth, Devon, England, married Mary, daughter of Arthur Holdsworth, and had the following issue with her: 1) Thomas Holdsworth (of Maismut), 2) Henry Holdsworth (of Waterford, married Margaret, daughter of Samuel Boyse of Bannow, had a son named Henry Holdsworth of Bannow, a Captain in the Royal Navy, Justice of the Peace and Deputy Lieutenant, successor to the Bannow estates in 1864, married Emily Steele, had issue, his siblings including William Boyse, Thomas Boyse, Reverend Robert Shapland, Richard Arthur, Dorothea Boyse, and Jane Ellen), and 3) William Cholwich. His son, William Cholwick Hunt was an Esquire of Dartmouth, M.D., married Mary, daughter of Nicholas Brooking of Bulkay Devon, with whom he had the following children: 1) Henry (his heir), 2) Arthur (of Quintella, married Mary Anne Roupe, issue named Arthur Roupe and Mary), 3) Holdsworth (married Ellen, daughter of Joseph Barber, had issue William Claude, Francis, Ellen Holdsworth, Katherine, Louisa), 4) Anne Holdsworth, and 5) Elizabeth (married Reverend George Langmead). He died in 1837 and was succeeded by his eldest son Henry. This son, Henry Hunt, was an Esquire of Shermanbury Park, who was born in 1801. In 1832, he married Maria, daughter of Arthur Hunt of Redlap, and had issue with her as follows: Reverend Henry Warwick, Harriet Watson, and Maria Holdsworth. Reverend Henry Hunt Warwick, M.A., was born in 1835 and was the Rector and Patron of the Parish of Shermansbury. The Hunt Coat of Arms (or Hunt Family Crest) is blazoned as follows: Azure, on a bend between two water bouquets or, three leopards’ face gules. Crest: On a mount vert against a halbert erect in pale or, a talbot sejant gold collared and lines gules. They were seated at Shermanbury Park, Henfield, Sussex. Samuel Hunt was an Esquire of Ketton, in county Rutland, England who was also a High Sheriff in 1860-1861. In 1838, he married Charlotte, daughter of Reverend J.W.R. Boyer, Rector of Swepetonce, county Leicester, and had issue with her as follows: Robert (born 1851), Charlotte, Clara-Fanny, and Ellen Mary. They were seated at Ketton, near Stamford, Rutland. The ancestry or pedigree of this family traces back to Henry Hunt, Esquire of Gosfield, county Essex, England, who was a High Sheriff in said county. He married Jane de Vere, of the noble House of Oxford, and had children with her named John, Henry, Dorothy, and Jane. The eldest son, John Hunt, was a Captain in the army during the time of King Charles I, and was one of “The ’49 Officers”. He was granted land in the barony of Talbots Town, county Wicklow, in 1667, for his services in Ireland. He was succeeded by his son Vere. This son, Vere Hunt, was an Esquire of Williamstown, county Limerick, Ireland. He was purchased estates in county Limerick. He married a woman named Mary and had a son: 1) John (of Glangoole, born 1633, married daughter of John Hicks, had daughters named Alice, Susan, Gertude, John, Daniel, Vere, and William, he secondly married Miss Bowles and had issue named Elizabeth, Anne, Mary, Peneople, Rebecca, Lucy, Dorothea, Ameila, Thomas, Henry, James, and George). John died in 1737 at the age of 103 and was succeeded by his eldest son, Vere. This son, Reverend Vere Hunt, of Glangoole, in 1712, married Constance, daughter of Sir William Piers, 2nd Baronet of Tristernag, and had issue named: 1) John (married daughter of William Turvin of Tennor), 2) William (married a daughter of the Lane family), 3) Vere (his heir), and 4) Henry (married daughter of Robert Bradshaw, had issue named Vere Dawson, Fitz-Maurice, Piercy, Henry, Damer). He was succeeded by his son Vere. This son, Vere, was an Esquire of Curragh, county Limerick, Ireland. In 1760, he married Anne, daughter of Edmund Browne of New Grove, and had issue with her as follows: 1) Jane (married John Hamilton Lane of Lanes Park), 2) Sir Vere Hunt (Baronet of Curragh Chase in 1784), and 3) John Fitz-Maurice (High Sheriff of Limerick in 1802, married Jane Henn of Paradise and later Frances, daughter of Colonel Evans of Carass). He died in 1681. His younger son, Henry Hunt, was an Esquire of Ligadoon, and had had five children as follows: 1) John (of Ligadoon), 2) Henry, 3) Robert (had a son named Robert of Inchirourke, married Gertrude, daughter of Edmund Browne of New Grove), 4) Anne (married Vere Royse of Nantenan of Limerick), and 5) daughter (married Reverend Thomas Widenham of Milford). The second son, Henry Hunt, was an Esquire of Friarstown, who married Margaret, daughter of Daniel Widenham, and had three issue with her: 1) Vere (heir), 2) Daniel (of Ballygaddy, county Galway), and 3) Henry (of Clorane, county Limerick, married Arabella Matthews of Kilkenny). He died in 1762 and was succeeded by his eldest son Vere. Vere Hunt, Esquire of Friarstown, married Anne, daughter of William Maunsell, and had issue with her as follows: 1) William (his heir), 2) Reverend John (of High Park, married Mary Anne Hunt of Millbrook, had issue named Vere, Fitz-Maurice, Mary Anne, Wilhelmina, and Fanny Margaret), 3) Thomas (married Dorothea Bloomfield of Redwood, had issue named Frances, Anne, Vere, Robert of Cloghadromin and Green Hill, and Rochfort), and 4) Mary (married Robert Ross, had a daughter named Anne, who married Henry Davis Hunt). He was succeeded by his eldest son William. This son, William Hunt, was an Esquire of Friarstown who married Elizabeth, daughter and heiress of David Urquhart, Esquire of Newhall, had issue as follows: 1) Vere David Urquhart (heir), 2) William Henn (born 1795, married Ellen, daughter of George Bonque Rochfort of Pierstown, county Westmeath, and had issue with her named William Robert, Major Rochfort Vere, Anna Maria, Jane, and Elizabeth Harrison). He died and was succeeded by his eldest son, Vere. This son, Vere David Urquhart, Esquire of Friaststown was born in 1794. In 1816, he married Jane, daughter of Henry Hunt of Ballysinode, and had eight sons and one daughter with her as follows: 1) William (born 1818), 2) Henry (born 1820), 3) Vere, 4) George Hodges (in 1866, married Susan, daughter of Reverend Godfrey Massy, Rector of Bruff, had issue named Vere David Urquhart of Faha, Godfrey Massey, and George Hodges), 5) John Thomas Urquhart (of Friarstown), and 6) Edmond Langley (of Curragh Bridge, married daughter of Samuel Dickson Power of Monroe, had son named Valentine Vere born in 1860, later married a daughter of Lieutenant Colonel Francis William Dillion, had issue with her named Francis William, Edmond Langely, Henry, Edward Dillon, William Power, Rochfort Noel, and Annie Henrietta), 7) Fitz Maurice (born 1836), 8) Samuel Bradshaw (Surgeon-Major in the army, married Emma Matilda, daughter of Frederick Clarke, had issue with her named Frederick John Robert and Vere Henry Wilson), and 8) Elizabeth Mary (married Mathew Shine). 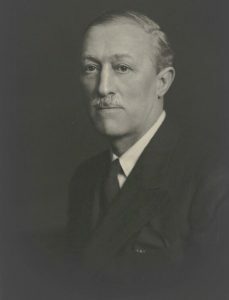 The successor was Vere David Urquhart Hunt, an Esquire of Ballysinode, county Tipperary, and Faha, county Limerick, Ireland who was born in 1856. In 1878, he married Elizabeth, daughter of Arthur Russell, Esquire of Lemonfield. The Hunt coat of arms is blazoned in the medieval art of heraldry as follows: Azure, on a bend between two water bougets or, three leopard’s faces gules. Crest: A leopard’s face as in the Arms. This family was seated at Faha, Patrickswell. This branch of the family tree descended from a common ancestor, two ancient families of the name Hunter: Hunter of Hunterson in Cuminghame, county Ayr, and Hunter of Polmood, Tweedale. Two of the earliest known members of the family were a) Norman Venator (or Huntar) who lived between 1080 and 1165 AD and b) William Venator, who was a witness to an inquisition in 1116 AD. They appear to have participated in the Norman Conquest of England, and then traveled north with David I, who had married Maud, grand-niece of William the Conqueror. Norman Huntar received a land grant in the barony of Arnele on the west coast of county Ayr, Scotland. It is said the grant was issue by King Malcolm IV. Descending from them was a man named Aylmar de la Huntar, who in 1296 AD, signed a submission to King Edward I of Engand, and his grandson was granted lands for this act. His grandson was William Hunar and he held lands in Arnele. From William descended one William Huntar or Arnele Huntar, lived in the 1400s and was keeper of the Forest. He died in 1454 and was succeeded by his son, Archibald Huntar, 13th laird of Arnele Huntar, or Hunterson. He married Margaret, daughter of William, Laird of Kersland, and he died in 1487. His son was John Huntar, 14th Laird of Huntarston, or of that Ilk. John married Margaret, daughter of John, 2nd Lord Cathcart. He died in 1513 and was succeeded by his son Robert Huntar. Skipping forward numerous generations came Robert Hunter. 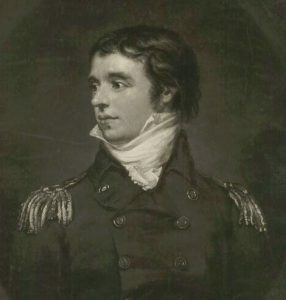 Robert Hunter was an Esquire of Hunterson, or of that Ilk, of Hunterson House and Castle, county Ayr Scotland, as well as a Justice of the Peace and Deputy Lieutenant, born in 1799. He was the son of Eleanora Hunter and Robert Caldwell. In 1836, he married Christopher Macknight, daughter of William Crawfurd of Cartsburn and Jane Crawford of Broadfield, and had the following children with her: 1) Jane (married Lieutenant Colonel Gould West of Weston of Weston-under-Lyzard, had sons named Aylmer Gould and Reginald Hugh) and 2) Eleanora (married Robert William Cochran Patrick, Esquire of Ladyland and Woodside, counties Ayr and Renfrew, had issue named William Arthur and Agnes Eleanora). The coat of arms of this branch of the family tree is blazoned as follows: Or, three hunting horns very garnished and stringed gules. Crest: A greyhound sejant proper gorged with an antique crown or. Supporters: Two greyhounds proper gorged with antique crowns or. Motto: Cursum perficio. 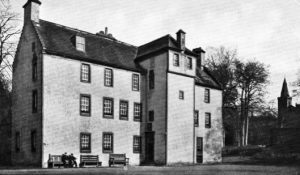 They were seated at Hunterson, West Kilbride, Ayrshire. Sir Vere Hunt, 1st Baronet, also named Subrey de vere Hunt, was born in 1761 , the son of Vere Hunt of Curragh Chase, county Limerick, Ireland and Anne Browne (daughter of Edmund of New Grove). He became an Irish businessman, landowner, and politican. In 1784, he came High Sheriff of Limerick and a baronet in the Baronetage of Ireland. He also raised and commanded three foot regiments during the French Revolutionary Wars and then became a member of the Irish House of Commins for Askeaton in 1798. 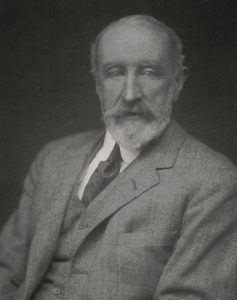 He married Eleanor Pery, daughter of William Pery, 1st Baron Glentworth and Jane Walcott, and they had a son named Sir Aubrey de Vere, 2nd Baronet. This son was born in 1788 and became an Irish poet and landowner. In 1832, he changed his surname from Hunt to de Vere. He marred Mary Spring Rice, daughter of Stephen Edward Rice and Catherine Spring. He succeeded his father in 1818. The third baronet was Sir Vere Edmond de Vere (1808-1880). The 4th Baronet was Sir Stephen Edward de Vere. He was born in 1812 and was the son of the 2nd Baronet. He came an Anglo-Irish Member of Parliament. He never married and his estates passed to his nephew, Aubrey Vere O’Brien. Roger Hunt was born in Sudley, Warwickshire in 1450 AD. He married Elizabeth Milton and had a son with her, also named Roger. Roger was born in Sudley in 1470 AD. He married Mary Walton and has a son with her named Thomas. This son, Thomas Hunt of Exeter, was born in Bisley, Gloucestershire, England in 1490 AD. He married Agnes Elizabeth Storbridge and Alice Hill. 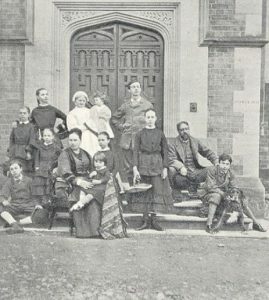 He had the following children: Thomas (of Chudleigh), George, Alice Welles, Julyan, Elizabeth, Hanibal, Roger, William, John, and Maria or Marie Fullwood. His son, Thomas, was born in Sudborowe around 1539. He married Joane Ball and had children with her as follows: Thomas Jr., Bennet, John, Roger, Robert, Florence (Passmore), Agnes, and Joan. His son Bennett Hunt was born around 1573. He married Elizabeth Ameredith and had children with her as follows: John and Elizabeth. His son John was born in 1623. He married Frances and had a son with her, also named John. This son, John Hunt, was born around 1650 at Newtown, Long Island, in the New Netherlands (later called New York once control passed from the Dutch to the British). Thomas Hunt was born around 1530 AD. He married Alice Pollarde and had issue with her as follows: Samuel, Johane, Richard, William, Angelica, Robert, Thomas, Elizabeth (Pratt), and Margaret. His son, Robert was born in Halifax, Yorkshire, England around 1565. He married Jane Fysher and had a son with her named William. This son, William Hunt, was born in Halifax, England around 1603. He married Elizabeth Best in England around 1630. He came to colonial America in 1635 aboard the Susan and Ellen. In 1664, he married Mercy (surname not recorded). He had the following children: Susannah (Todd), Mary Anne (Wood), Nehemiah, Samuel, Ann (Wood), Elizabeth, Hannah (Brundage), Hannah (White), Isaac, and William. His son Samuel was born in 1633 in England. In 1657, he married Elizabeth Redding at Ipswich, Massachusetts. He had the following issue: Peter, Samuel, Elizabeth, William, and Joseph. His son, Joseph Hunt, was born in Ipswich, Massachusetts in 1665. He married Elizabeth Huntington and Ann Pengry and had three issue: Joseph, John, and Elizabeth (Barlow). His son Joseph was born in Somers, Connecticut in 1704. He married Anna Wood and had a son named Joseph. This son, Joseph Hunt, was born in Somers, Connecticut in 1729. In 1750, he married Bathsheba Pease, and had the following issue with her: Bathsheba, Eleanor, Anna, and Peter. His son Peter was born in Sommers, Toland, CT in 1751. He married Marah Colton and had issue with her as follows: Joseph, Lois, Molly, Mary, Eunice, Peter, and John. His son, John Hunt, was born in Connecticut in 1788. In 1810, he married Philinda Hutson, and had children with her as follows: Marica, Christiana, Mary (Tucker), Eliza (Batcholder), Clarissa, and William Strong. His son, William Strong Hunt, was born in Hamden, Ohio in 1826. He married Emily Ward in Illinois in 1851 and had three children: Elsie, John, and Olive. His daughter, Olive Hunt, was born in 1857. She married a member of the Weaver family and died in Greely, Colorado in 1934. 1) Bartholomew Hunt of Dover, 1640, had wife named Ann and had children named Bartholomew (1654), Adam (1656), Naomi (1658), Ezekiel (1663) and others. 2) Edmund Hunt of Duxbury, 1637. He was from Cambridge in 1634. He was a surveyor of roads. 5) Enoch Hunt of Weymouth, 1650, a blacksmith, who came from Lee, a parish in Bucks near Wendover, and had a daughter name Sarah (1640) and a son named Ephraim. 8) Ralph Hunt of Newtown, Long Island, 1656, admitted a freeman to Connecticut in 1664. He died in 1677. He had children as follows: Ralph, Edward, John, Samuel, Ann, and Mary. Branches of this family were at Jamaica, Long Island and Newtown, Long Island, and one branch went to New Jersey. 9) Richard Hunt of Boston, with wife Mary, had Richard (1676, died young) and Richard, again (1680). He died in 1682 at the age of 48 years. 12) Thomas Hunt of Boston, with wife Elizabeth, had children named Jabez (1655) and John (1656). 15) Thoms Hunt of Boston, with wife Joanna, had issue named Thomas (1677), and my wife Mary had Thomas (1681), Priscilla (1688), Mary (1690), Sarah (1692), Joanna (1695), Martha (1697), Jobez (1698), and Elizabeth (1700). 17) William Hunt of Concord, a freeman in 1641, had sons named Samuel, Nehemiah, Isaac, William, and daughters including Hannah. His wife Elizabeth died in 1661. He moved to Marlborough, and in 1664, married Mercy Hurd. He died in 1667. In 1635, Edward Hunt, 19 years old, came to Virginia aboard the Transport. In 1635, Ralph Hunt, 22 years old, came to Virginia aboard the Primrose. In 1635, Joseph Hunt, 23 years old, came to Virginia aboard the George. In 1635, William Hunt, 21 years, came to Virginia aboard the Constance. In 1635, William Hunt, 22 years, came to Virginia aboard the Abraham. In 1679, John Hunt, came to Boston aboard the Providence. Other settlers in colonial America bearing this surname include Robert Hunt (Virginia 1607), Nicholas Hunt (Virginia 1622), John Hunt (Virginia 1622), Edmund Hunt (Massachusetts 1634), Lancelott Hunt (Virginia 1704), Elinor Hunt (Virginia 1705), Temperance Hunt (Virginia 1713), and Hannaway Hunt (Virginia 1714). In Canada, two of the earliest settlers with this last name include Jane Hunt and Oliver Hunt, who came to Nova Scotia in 1750. In Australia, William Hunt (convict from Staffordshire, England) and William Hunt (convict from London) came to New South Wales aboard the Almorah in 1817. In 1824, Thomas Hunt, a convict from Worcester, came to New South Wales aboard the Asia in 1824. In New Zealand, Robert Hunt came to Hokianga in 1830. Charles Hunt came to Wellington aboard the Adelaide in 1840. George Hunt came to Wellington in 1840 aboard the Aurora. Henry Hunt came to Wellington aboard the Martha Ridgeway in 1840. 1) Gules on a fess or between 3 cinquefoils a lion passant. Crest: a boar’s head couped erect between 2 ostrich feathers. Notepaper used by Lucy Hunt Smith (Mrs. James M. Smith) of Northampton, Mass. 2) [Gules] on a fess between 3 cinquefoils [or] a lion passant guard [of the field]. Crest: a boar’s head erect between 2 ostrich feathers sable. Motto: Vi nulla invertitur ordo. Bookplate Frederick Thayer Hunt. E. B. Bird, des. 3) Per saltire 2 hearts in fess. Seal of Richard Hunt of Boston, late of Portsmouth, Eng. “Bisket Baker” on indenture of partnership, 1674. Owned by C. P. Greenough of Boston. 1) Thomas Hunt of Pasquoalank, North Carolina, 1659, from Buckinghamshire, England. Arms: Azure, on a fesse argent between three cinquefoils or, a lion passant gules. Crest: A boar’s head couped and erect between two ostrich feathers. 2) Thomas Hunt of New York, 1667, from Shropshire, England. Arms: Per pale argent and sable, a saltire counterchanged. Crest: A lion’s head erased per pale, argent and sable, collared gules lined and ringed or. 2) John Hunt of Paddon, Devo, 2 June 1510, granted by T. Wriothesley. There are hundreds of notable people with the Hunt surname. This page will mention a handful. Famous people with this last name include: 1) Alfred Hunt (1817-1888) who was the first president of Bethlehem Iron Company, which later became Bethlehem Steel, born in Brownsville, Pennsylvania, 2) Charles Cooke Hunt (1833-1868) who was an English explorer who led expeditions into Western Australia during the 1860s, 3) Everette Howard Hunt Jr. (1918-2007), was an American intelligence offer who published 73 books, born in Hamburg, New York, 4) Roger Patrick “Ernie” Hunt (1943) who was an English football (soccer) player who played from 1959-1974, born in Swindon, 5) Frank Williams Hunt (1861-1906) who was the 5th Governor of Idaho and a veteran of the Spanish-American War from 1901-1903, born in Newport, Kentucky, 6) Frederick Vinton Hunt (1905-1972) who was an scientist, inventor, and Harvard professor who worked in acoustic engineering, born in Barnesville, Ohio, 7) Washington Hunt (1811-1867) who was the 17th Governor of New York in 1851-1852 and was also a member of the US House of Representatives from 1843-1849, 8) Robert Hunt who was the Governor of the Providence Island Colony in the Caribbean from 1636-1638, 9) Robert H. Hunt who was a Colonel in the Union Army during the American Civil War who later went on to become the Mayor of Kansas City, Missouri in 1872, born in County Kerry, Ireland, and 10) Helen Elizabeth Hunt (1963) who is an American actress from Culver City, California known for her role in the TV series Mad About you, as well as films such as Twister and Cast Away. Three of the main heraldic symbols depicted within the Hunt Coat of Arms (incorrectly referred to as the Hunt Family Crest or Hunt Family Shield) are the hunting horn and leopard’s face, each which have their own unique meaning. The hunting horn, or bugle horn has a distinctive shape, being curved almost into a semi-circle, it can be decorated with bands of a different color and typically hangs from a string, also colored. Apart from its obvious reference to the pursuit of hunting, it has also been used in allusion to the name of the holder (HUNTER of Hunterston) and Woodward suggests it is also associated with those who have rights or obligations to the forest. The bugle horn can also be a symbol of military service. In the Bible, the archangel Gabriel blows such a horn when hunting a unicorn. The leopard’s face (sometimes, incorrectly referred to as a leopard’s head) occurs very frequently in heraldry. Early heraldic artists tended to treat lions and leopards as the same animal, but during the development of British Heraldry the heads of the two creatures have adopted separate, and more realistic forms. Wade would have us associate leopards with warriors, especially those who overcome “hazardous things by force and courage”. In ancient Egypt, priests wore leopard skins to ward off evil spirits. In ancient Greece, the god Dionysis is often depicted riding a leopard and/or wearing its skin. In ancient times, the leopard was called “the Great Watcher” as the many spots represented eyes.